Yeah…so there’s that. Basically I loved this book. LOOVEDDDD the characters and the setting and it was one of my biggest book hangovers OF THE YEAR. Remember how I said I wanted more world building while I was reading Cinder? Marissa Meyer delves right in and we are able to see a bigger landscape in Scarlet, complete with bonfires and farm frolicking (erm..kind of). Scarlet Benoit has made my list of favorite female characters of all time. She is plucky and rough and fights her own battles. She is determined to find her grandmother and though she works hard to do what is right in most situations, she also has no problem getting dirty to do what needs to be done. Then there is Wolf and I don’t even know what to say about him because he is so swoonworthy I can’t even…I am all for the strong females who can take care of themselves but I also love a guy who stands up for his lady and maybe Wolf gets a little overprotective and ya know…murderous…but I’m kind of okay with that given the yumminess. Also Meyer introduces us to some other fabulous new characters, I specifically adored Captain Thorne. He is quite a character, he is intelligent, snarky and kind of crazy. Though Wolf is my favorite guy, I have joined the fangirling of Thorne as well. Scarlet and Cinder are vastly different characters and while reading book one I sometimes had a hard time connecting to Cinder. While reading Scarlet I didn’t only feel more connected Scarlet Benoit but I reconnected with Cinder and better appreciated her to the point where I can’t wait to go back and re-read Cinder. This entry was posted in Reviews, Young-Adult and tagged fairy tales, fantasy, romance, Science Fiction, young adult. Bookmark the permalink. ← Project Fairy Tale: Welcome! 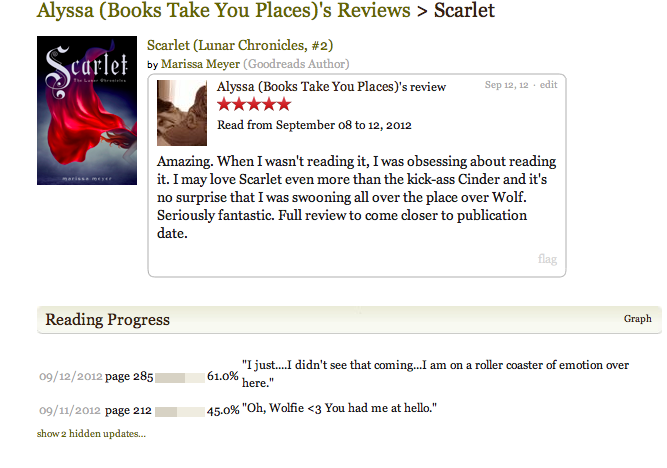 Haha-we both posted our reviews of Scarlet today. 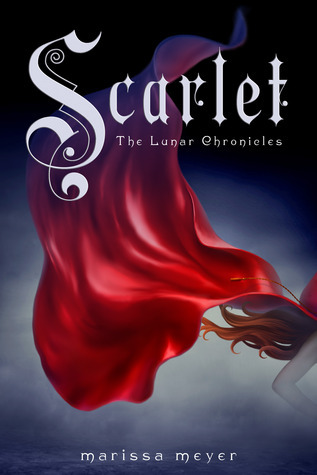 I was one of the bloggers who didn’t fall in love with Cinder (the book-I liked the character a lot) but I’m so glad I read Scarlet because I ended up adoring it! I liked Cinder enough to want to continue on but I really adored Scarlet! I CAN’T WAIT FOR YOU TO READ THIS ONE TOO!! YES. Dude Scarlet was totally my favorite. Don’t get me wrong, I liked Cinder, but I LOVED Scarlet. AND WOLF >Kai. Always. Pretty much I love this review. Wolf was totally more of the brooding, bad boy “I am no good for you” character and I ALWAYS go for that guy..not sure what this says about me! I was the same way while reading Scarlet. I was obsessing about it, even when I wasn’t able to read it (at work, etc). Marissa Meyer is totally amazing! I am so happy I gave these a try, they were 2 of my top reads of 2012!! I am excited for EVERYONE to read Scarlet!! Keep me posted! TOTALLY AGREE. I loved Cinder and then re-read it and loved it even more. But I can’t EVEN believe how much fun Scarlet is. Plus I was thrilled at how much Cinder is included in Scarlet’s book, so it’s like the best of both. I’m gonna wait a while and re-read it. I am beyond amazed at Marissa Meyer’s imagination. And WOLF. Yay! I am hearing great things about this book! Can’t wait! Hehe, so you know what I realized when thinking of my love for Wolf and Thorne? Wolf is totally the kind of guy I pick as a book boyfriend. Thornes more the kind of guy I date in real life…I’m not sure what that says about me, but I’m cool with it. Also, I LOVE Scarlet–I think it’s fantastic that all of her characters are so damn well done. They’re all strong in their own ways, and so easy to love or hate. So glad you’re hooked.